As the first of my harvest comes in I am reminded of what it must have been like to live off the land. In the summer you ate whatever was in season. You went out to the garden and that was what you ate. No one at peaches in December or asparagus in September. For the past week it has been all about zucchini at my house. Soon it will be something else, and if I’m lucky, an assortment of vegetables. Unfortunately, when you have one zucchini you have ten. They don’t cooperate and ripen one at a time. There is no way I can eat all these veggies, so I am coming up with imaginative ways to eat, store, or repurpose it. This post is about the green wonder. I have been eating zucchini for about a week now. I ate one in two meals on two separate days. Each time I went out to the garden I saw more zucchini. It was then I realized I needed a plan. I started giving them away to my neighbors and friends. 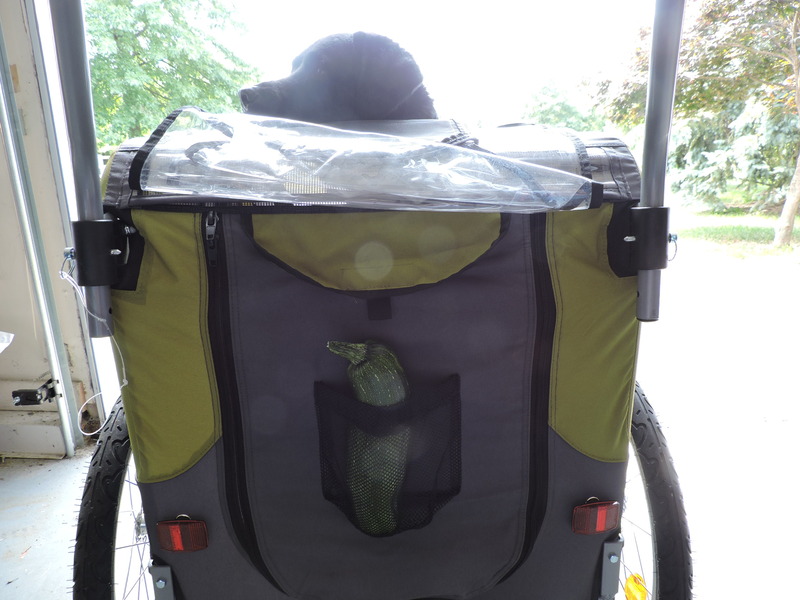 I walked the dog and met a new neighbor: “do you like zucchini?” Later I would deliver it. I had some work done in the yard and sent them home with zucchini. I went to knit group and bought zucchini bread. Even with all this generosity each new day brings more green deliciousness. It also struck me that the point of having a backyard garden was to put aside the excess to eat another day. So I stopped giving it all away. Shiloh helps me deliver some zucchini to a neighbor. I went to the Internet for advice. I googled “healthy zucchini bread” and made whole wheat zucchini bread with wheat germ, chocolate chocolate chip zucchini bread, and zucchini bread with pineapple and pecans. Did you know you can make zucchini bread with rice flour? Most of the zucchini bread went into the freezer. Then I checked on “grated zucchini.” Did you know you can make a nice soup with grated zucchini and sundried tomatoes? And, better still you can freeze grated zucchini. Yesterday I picked three more veggies and filled up ziplock bags with two cup portions for a rainy day next winter. I made a grated zucchini stir fry with broccoli, peppers, garlic, and tomatoes. Earlier this week I made another zucchini delight, this time with sliced zucchini. I’m thinking of adding it to tomato sauce, making pancakes, more zucchini bread, and using in a vegetable kugel with grated carrots and potatoes. Fresh zucchini all winter! The zucchini that almost got away . . . The green ones are coming fast and furious. I missed this one and after a few days of rain it was ginormous. In other parts of the vegetable world . . . But lest you think that I only have zucchini in the garden, let me introduce you to the other characters in this play. The peas are just about done. I’m going to pick what’s left and pull them up to make space for something else. My peppers are just starting to come in. The cubanelles are getting long. The rest are growing fast as well: Italian frying peppers, bell peppers and jalapeños. The last of the peas. Next year I’ll plant more. I have one lonely Japanese eggplant on the vine. As I mentioned earlier, for some reason the flowers on my eggplant plants opened and then fall off, too weak to carry a bulbous eggplant. I am hopeful that more will follow. The broccoli and cauliflower have been attacked by a cabbage bug. I got something to spray on them that’s organic. Time will tell if it has worked. In the meantime, a few of my broccoli have started looking like a vegetable. I don’t know how this happened, but I expect they will taste the same as a straight one. I am training them to climb up a trellis so they will have plenty of space. I had fun day yesterday. It started early with a long walk on the Perkiomen trail with my knitting group buds. Barkley came too. I spent most of the rest of the day pulling weeds and putting down mulch. The dogs are out on the deck with me. Barkley has his eyes peeled for rabbits. I’m going to start cooking soon. You have one guess as to what I’ll be eating tonight! That’s right, more zucchini. Looks like you are enjoying the fruits of your labor and your garden is freely offering up its bounty. FYI: when you defrost the shredded zucchini, it will be more watery than freshly grated zucchini. Thanks for reading my post Laura and for the zucchini tip. It’s a lot more work than I thought, but the veggies carry most of the load! We are eating lots of zucchini around these parts too! I’m glad I read your post, I will be freezing some zucchini bread! I do love zucchini, but I have to admit that I am getting tired of it every day. I tried zucchini and sundried tomato soup tonight, but am still freezing a lot of it. Fortunately everyone loves zucchini bread, especially if you add chocolate chips! Thanks for reading my post and good luck with your garden.